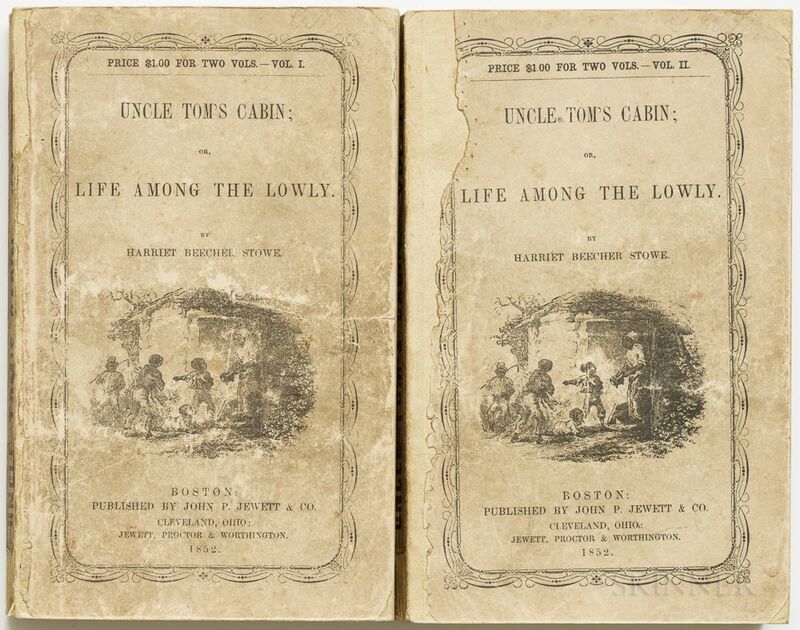 Stowe, Harriet Beecher (1811-1896) Uncle Tom's Cabin, First Edition in Paper Wrappers; A Key to Uncle Tom's Cabin; Autograph Letter Signed, and Receipt for Enslaved People. Boston: John P. Jewett & Co., Cleveland [and] Ohio: Jewett, Proctor & Worthington, 1852. Two small octavo volumes in publisher's paper wrappers, priced $1.00 for both volumes (spines of both volumes repaired, title of first volume mostly intact, fragmentary on second volume, blank back cover repaired but present for the first volume, back cover volume two replaced; [together with] Facts for the People. 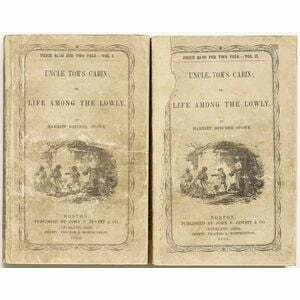 A Key to Uncle Tom's Cabin, Boston: Jewett & Co.; Cleveland: Jewett, Proctor & Worthington; [and] London: Low and Company, 1853, in publisher's paper wrappers; autograph letter signed by Stowe, Andover, 27 October 1852, folio format laid paper sheet inscribed over one and a half pages; to an unnamed male recipient, thanking him for sending an article, and mentioning several aspects of her abolitionist cause, "Any one that stirs up this subject of southern law as a defence of slavery emphatically wakes up the wrong passenger. Nothing more is needed than to awaken the attention of the public to an expose of the slave law system. If they desire law on this subject, they shall have." 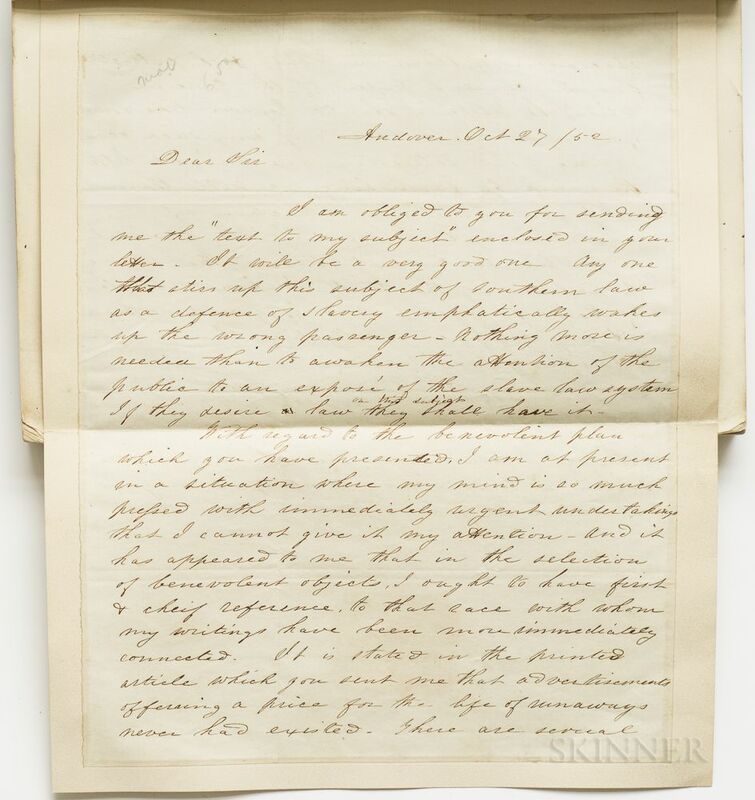 [and later] "It is stated in the printed article which you sent me that advertisements offering a price for the life of runaways never had existed. There are several specimens in Weld's book extracted from the current papers of the time in which he wrote. I should however like some of a more recent date & if any such occur among your collection you might help the cause by furnishing me with them." and more; [together with] a folio-format blue laid paper bifolium document from New Orleans, 16 November 1853, titled, "Succession of Catherine Dinet," listing enslaved people sold at auction, including Cecilia, aged 41, and her two children, Areene, five years old, and Vincent, four years old; a 19 year-old girl named Louisa, and a 15 year-old girl named Jacqueline; both of these documents tipped into A Key to Uncle Tom's Cabin; books housed in custom boxes.